The joint project UPLINX is a cross-location qualification programme for machine learning with direct practical and application relevance. The joint project runs nationwide at all DFKI locations with the participation of the Academy of Engineering Sciences (acatech) under the direction of the Robotic Innovation Center. 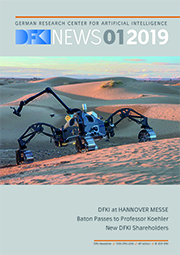 In summer 2019 UPLINX will lead to summer schools and industry workshops at all DFKI locations. Uplinx's concept includes the restructuring of university teaching through new lectures and topics, seminars, project work and theses. For the research and industry context, workshops and machine learning schools will be offered in 2019 at all DFKI locations. In January 2018 with the participation of all DFKI locations and the Academy of Engineering Sciences (acatech), the joint project UPLINX was launched: a cross-location qualification programme for Machine Learning (ML) with direct practical and application relevance. 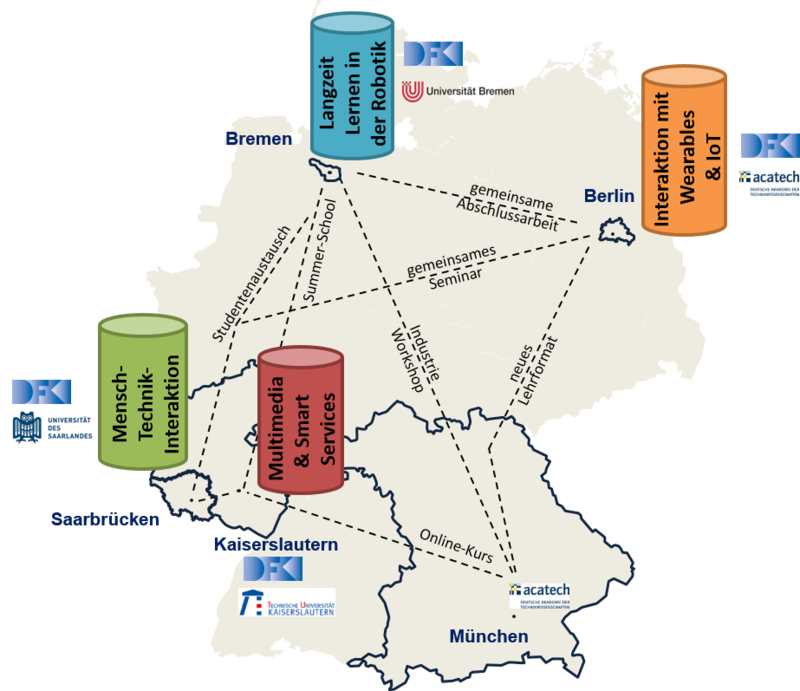 The project is coordinated by the DFKI Robotics Innovation Center in Bremen and comprises of qualification measures ranging from university teaching to industrial workshops oriented towards target groups. Through its bridging position as an institute of application-oriented research, the DFKI has excellent contacts to target groups from the university education sector as well as a large network in industry. In addition, the DFKI has a high level of technical competence in the field of machine learning as well as a broad wealth of experience in training in the graduate and postgraduate field and in the transfer of knowledge to industrial users. Registrations for the Machine Learning Schools and Workshops at the DFKI locations will be opened in spring 2019! The aim of UPLINX is to bundle the potential and competence of the DFKI across all locations, to coordinate them, to structure them methodically and organisationally and to make them available as a comprehensive portfolio in a sustainable and practical way. As such, UPLINX seeks to create a qualification programme – dynamically integrated and maintained – that incorporates the current state of research and training, as well as future developments and trends in the field of ML . At the Bremen location, the Robotics Innovation Center will focus on the implementation of intelligent software components for robotic systems. Basic knowledge about required frameworks and approaches for the control of robots as well as their sensors and actuators. Formation of environmental representations of a robotic system. From route planning to collision avoidance. The participants of the workshops and the Machine Learning School are introduced to a required software framework and background knowledge in the areas of machine learning, navigation, mapping and robotic manipulation, whilst also implementing their newly acquired knowledge in a practice-oriented manner on several Turtlebot platforms. In the teaching concepts, the diverse professional backgrounds of potential participants are taken into account, both in terms of their professional orientation, IT affinity and previous knowledge in the specific subject area. The participants of the courses can thus – according to their technical background – implement different tasks on the robotic systems. For example, machine learning methods can be implemented for object detection and tracking with deep neural networks, studies can be carried out with the manipulator arms or simple movements of the system can be controlled by gesture recognition. Courses will include different formats from lectures to workshops on individual topics. The participants will experiment with sensors and actuators for different applications. At the Berlin location, the Interactive Textiles department focuses on the development and implementation of application-oriented concepts of wearable prototypes, involving human-machine interaction with smart textiles and soft interfaces using methods of interdisciplinary and participatory design research. The participants of the workshops as well as the Machine Learning School get to know a user-oriented development process and actively contribute to the design of interdisciplinary research patterns for data collection and the creation of functional demonstrators and concept models. A reflection of wearables and IoT also makes it possible to address the challenges of data analysis and pattern recognition in textile sensors and to implement them in application-oriented machine-learning procedures in the courses. In the teaching concepts, different professional backgrounds of potential participants are taken into account, both in the professional orientation, IT affinity and previous knowledge in the specific subject area. The participants of the courses can experiment with different forms of interaction and materiality and work with context-related data sets, depending on their professional background. At the Kaiserslautern location, the Smart Data & Knowledge Services department will focus on transferring knowledge in the field of machine learning with a special focus on illustrative examples from computer vision. Basic understanding of the Machine Learning Pipeline and its models as a "black box" that is trained and tested with separate data sets. Independent implementation of forward and backward pass of a multi-layer perceptron (MLP), including back propagation of gradients and optimization using Stochastic Gradient Descent. Depending on the respective target group (managers, technical staff, students), different levels of understanding are to be established: from a high-level overview of existing processes and their capabilities, to applied arithmetic operations and optimization processes, through to the required basic mathematical principles. The participants of the workshops and the Machine Learning School will first be introduced to the material through presentations. Subsequently, the concepts shown are internalized by means of practical application to classical example problems from science. The result of the individual exercises should be a functioning machine learning model for the specific application scenario. In principle, this requires a certain IT affinity even for “high-level events” (e.g. management training), since at least ready-made tools must be understood and applied. Nevertheless, the technical background of potential participants should be taken into account through various offers. This is to be achieved, for example, by preparing materials with different degrees of completion. A novice can gain a first insight into the world of machine learning by executing finished code and applying the finished model to execute it. Participants with programming experience, on the other hand, must add missing code blocks in order to arrive at an executable program. Here Ipython/Jupyter notebooks are envisaged, which can easily be made available for download on the online platform of the UPLINX project. At the Machine Learning School in Saarbrücken, Germany, topics from the field of machine learning in the environment of autonomous driving are presented in condensed, application-oriented form and deepened in practical exercises. The event in the university / academic environment is jointly organized by the departments Cognitive Assistance Systems (COS) and Agents and Simulated Reality (ASR). It is aimed at students, doctoral candidates and post-doctoral candidates who ideally have a basic knowledge of machine learning. The three-day event consists of lectures (background knowledge and presentation of application examples), practical exercises (contact with the data, trying out classification methods, using tools and ML frameworks) and expert discussions (industry experience). The illustrative application examples shown are primarily from the domain of autonomous or semi-autonomous driving. The methods will focus on deep learning and consider frameworks from this area, but other ML methods will also be addressed. In all cases, the connection with interaction techniques (e.g. in the visualization of data) is of particular importance.